The Cirneco has been in Sicily for thousands of years. Most authors agree that the origins of the hound-type dog lie among ancient Egyptian prick-eared dogs. Bas-reliefs discovered along the Nile and dated around 4000 B.C. depict what could be the Cirneco today. Most probably, the Phoenicians spread these prick-eared, hound-type dogs as they sailed along their trade routes between Northern Africa and the Mediterranean coasts. The most vivid proof of the presence of the Cirneco in Sicily for at least the past 2500 years is the many coins minted between the 5th and 3rd centuries B.C. depicting exemplars of the breed. 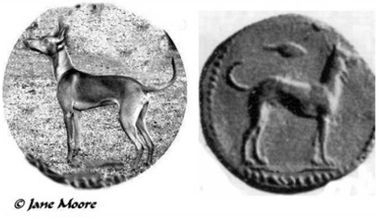 The Cirneco was used on coins used in various cities on the island with over 150 variations occurring on silver coins and more than 100 on bronze coins. The Cirneco was rarely seen and little known outside Sicily until 1932. In that year, an article was published in the journal “Il Cacciatore Italiano” (The Italian Hunter) denouncing the state of oblivion into which this ancient Italian breed had fallen. The Cirneco's cause was taken up by a group headed by a Sicilian aristocrat, the Baroness Agata Paternó Castello, a member of the family of the Dukes of Carcaci, who was to dedicate the next 26 years to the development of the breed, until her death in 1958. The first breed standard was written by Professor Giuseppe Solaro, an eminent zoologist, who studied the dogs' shape, proportions, and work methods. The standard was approved by the Italian Kennel Club (ENCI) in 1939. At last the Cirneco was recognized officially as a breed with the name "Cirneco dell'Etna". The first Italian Show Champion was declared in 1952. The Italian Kennel Club’s Standards Committee updated the breed standard in 1989 to bring it in line with the FCI format. The Italian Breed Club, recognized by the Italian Kennel Club in 1956, was founded in 1951.